There were a few statements Karr made that sounded like something out of the Zodiac letters. Although, reading them is like communicating with catseye. You don't get a straight answer to your question, and the conversation veers quite often. There was a statement in regards to "they don't understand how sensitive I am and how close I am to becoming silent forever. This sounds like JT in his final days... Also, the reference in the Tim Miller letter about the "silent killer no longer being silent." I have to check for the direct quote, but they read like a book when put together with others. Lots of reference to wanting a book made about him which DK states JT wanted done only after he died which is what these messages are screaming to me. This author is attempting to get the right story out there while attempting to portray some concern for the family. 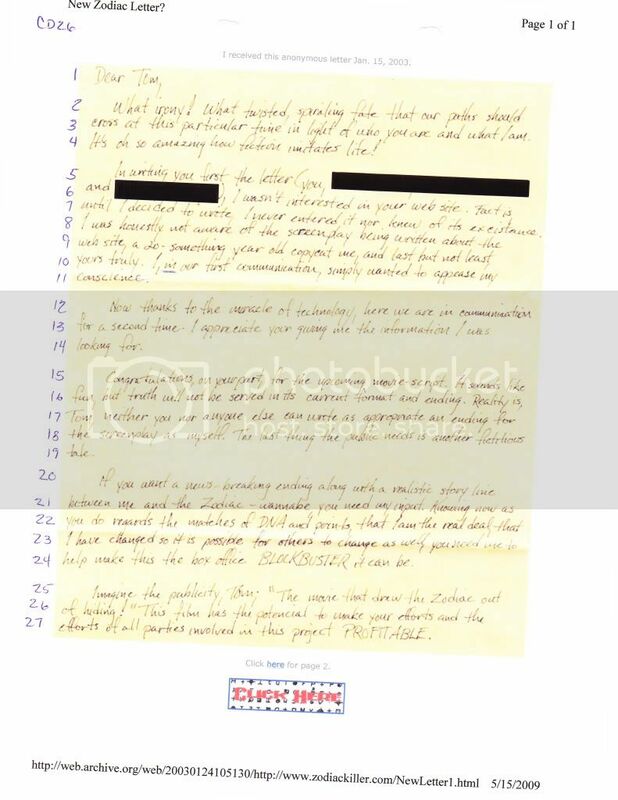 This is seen in the 2005 letter to Tim Miller. Reaching out to the parents for some kind of recognition. Also, the TV letters are consistently talking about a movie and having the right story..... These emails read like many letters including Zodiac's Badlands letter. Always reference to the story being straight. With no connection to the letter Karr makes references, but then recants... Like the we and us theory versus he doesn't want any other person considered in this crime. I have always thought that the letters read like a key, and it seems that there is more to these communications than I had initially realized. Page 51 of Karr's email, I see once again that he uses a term referring to silence, "Until then, I will remain silent." From letter to Tim Miller Sept. 2005, "The silent killer with his silence broken but my identity is still secret & understanding who is at fault is the key." 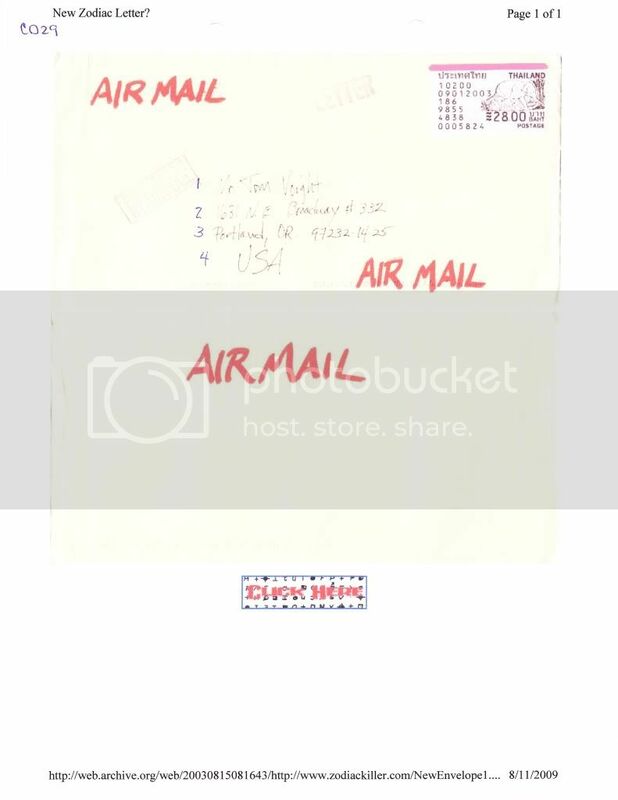 BTW, JT's aunt informed Tim Miller and DK that JT came to her home in Sept. 2005 looking for some boxes he had stored there, and that puts him in Texas with the ability to mail the letter to TM. This letter was a taunt to the family about the 12 year old daughter that was killed. The killer acts like he is doing TM a favor by writing this, and Karr's emails speak in the same mannerism towards the Ramsey's. Also, note the constant referral to a 12 year old by Karr. Also, the letter to TM calls him out by using his name at the end of the sentence just like Karr's emails when he uses Michael's name. For instance, "I am not the only one killing girls, Tim." versus Karr's "I can't do this, Michael" or "Thank you, Michael". It seems that he likes to use his name "Daxis" in this way as well by calling himself out as if to reiterate that he, the emailer, is Daxis and by saying it over and over again to ensure Michael knows this is who he is. The fact that the emails are written to Michael, should constitute a lack or need to constantly repeat his name in the communications, but this suspect does, and so did the suspect in the TM letter. Revised: So does the author of the TV letters, "Let me know, Tom, via your wonderful web site" and "Imagine the publicity, Tom" and "Reality is, Tom,...". All the while, the letter is written to Tom, again lacks a need to constantly refer to him. Kinda like the Zodiac having the need to refer to himself with a statement like, "This is the Zodiac speaking" DUH!!! We didn't know that??? You rarely see Michael use the name Daxis in his communications, and he never refers to himself like this psycho does. This is just another consistency in pattern/behavior. Page 54, Karr's emails, "Do you know that I have to get into an almost self induced hypnotic state to recall the events directly before the blow to her head and the events just following the blow to her head?" Letters to Tom Voigt, "In that state, I experienced the graphic deeds of the Zodiac Killer as if I was an observer not the perpetrator." Either way, there is a lot of talk about hypnotism with JT and his little hypnotic diagram that is in his own writing, and many family members remember JT using. PS "Karr" uses a whole lot of hyphens to stop and start subjects which is heavily noted in the other communications in these cases and including JT's own handwriting. They say you type and write like you speak... Many people using commas in typing where they would break to breath when speaking. I am sure I do it, and that I do not necessarily pay attention to proper sentence structure, but hey, I am not writing prose or publishing a book, so I do not find it necessary to be perfect in structure. If we were all perfect sentence writers, there would be no field for linguistic identification of type written documents, so I guess I appreciate that we all do it differently. Of all the deranged letters and emails of harassment that I have had to examine, only people with serious neurological issues will continually point out who they want the reader to believe who they are, and these emails from "Karr" are no different. Calls himself a teacher, and then follows it with, ""ME" the teacher". As if to promote the theory of who is really writing these communications. He mentions always coming into the home without shoes on as if to hold onto the Maintenance man theory, but continues to talk as if he is a teacher at the same time. I think this author has taken several different portions of media related facts about this case and has intertwined what he believes will continue to confuse people through these emails. Another theme that keeps ringing true between the "Karr" emails and the TV letters is that the person receiving the communication stands to make big money if they work with the author of the communication for the "real/true story", and both authors feel the need to show empathy for the families by providing monies from the venture to help with closure for the families or to do something good with it. I am seeing many huge resemblances between the authors of both TV's letters and "Karr's" emails. 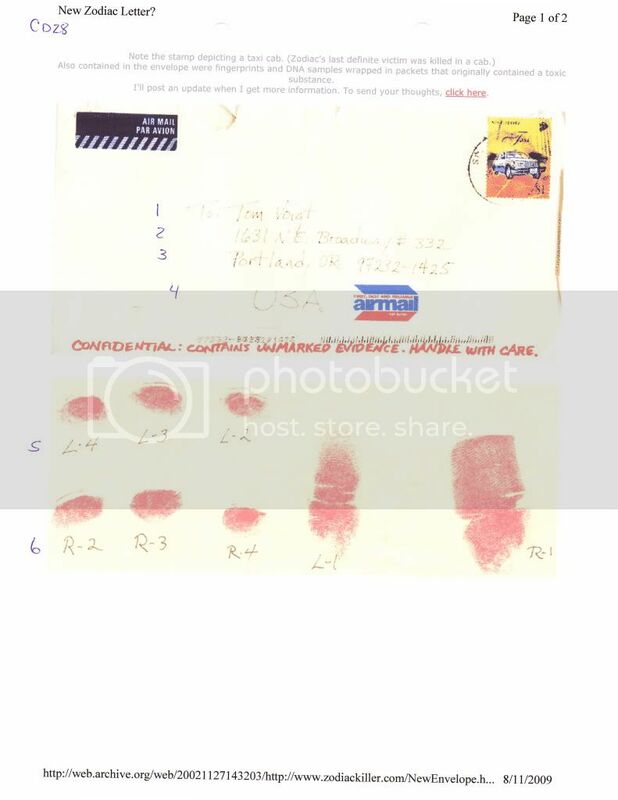 I had a feeling from the time I found the handwriting in the JBR case and heard that Karr absconded to Thailand and Singapore, that the letters written to TV from those very locations were somehow connecting the Zodiac to JBR.... I am on a new mission. "Karr's" emails reference the deeper meaning of "Alice in Wonderland" in page 64 of the emails. I am dumbfounded at this point because there is an article about "Alice in Wonderland" and the meaning of it in relation to another unsolved case we discuss. I will find it now too! I thought it was in the Zodiac documents, but need to confirm which case. There are just too many.... I am a gasp, and my jaw is on the floor! "Karr's" email account was set up September 2005. Is this merely a coincidence that Tim Miller was taunted in September 2005 as well, and JT went to Texas months before dying to retrieve boxes that had been stored at his Aunt's house for some reason in September 2005? Not to go to deep, but the email account server hushmail was located in Canada, and there was some question at one point about a 4th grader from a school only located in Canada in the Anthrax case. I'm sure this is reaching, but just a note to keep on file. I also probably have the information a little out of context, but I will follow up with the correct evidence found. Author of the "Karr" emails and TV letters share the same propensity to capitalize words to ensure potency of meaning. I find this to be prevalent in stalker communications that I exam in my cases. My goodness, I am only on page 110 of the emails to Tracey, and I have a page and a half of notes that cross connect these emails with the letters to TV. I will post my points once I have reconciled them, but I wanted to point out one linguistic comparison that almost solidifies that these emails were written by the same person who contacted TV. I know TV now denounces the letters from Thailand and Singapore as fakes written by some woman. Here is my problem with his theory and others which if I find that these communications are from one and the same person, then TV and many others have been lying about the events of Z and JBR for quite some time. Major find on email page 110 where "Karr" says that, "he can't put out the MEGAPAGES like Stephen King." The use of "mega" was found in the letter to TV where the author says, "the movie will be a MEGA-HIT" The theme here is "mega" and not too many people use this word as it is definitely generational, or much less actually use it in writing. This is a dead ringer like the, "I and the others" or "I and the police know" between JT and Z.
I will be back shortly with many more connections made so far! If I have the dates right, and these communications had been going on for four years then based on the latest dates of May 2006, "Karr" was contacting Tracey at the same time TV was being contacted by a person attempting to take claim as well. It all seems to wrap around each other waaaaayyy too nicely. 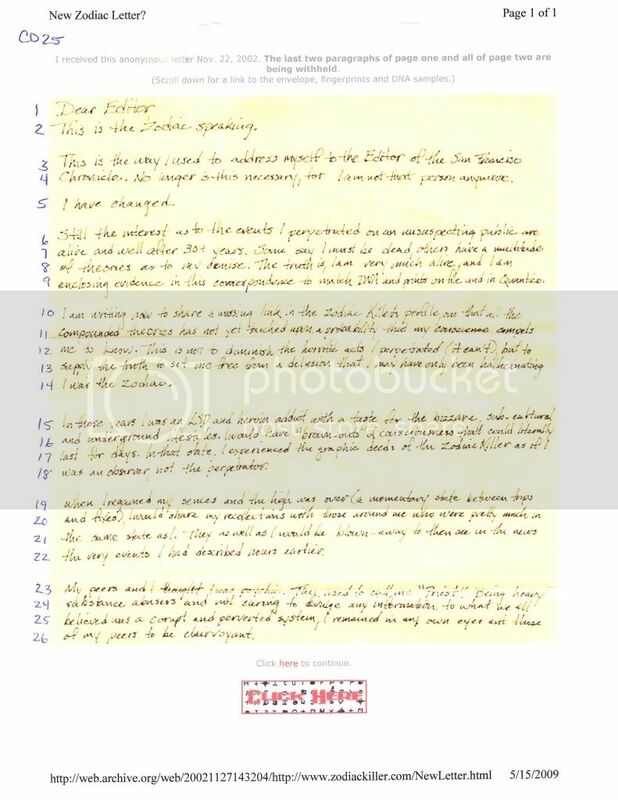 Bingo, page 114, "Karr" claims that he is aware of handwriting analysis and purposely made the note messy. B. Zodiac made reference to understanding forensics, and that no one would make a match on the handwriting or figure out his ciphers. I think that is because after the first one, all the rest were simply to distract as Z and JT both claimed. C. Either way, I now need to do a comparison with Karr's writing, TV's letters, and JBR ransom note just to be sure that he is in no way responsible for any of them, including these emails. 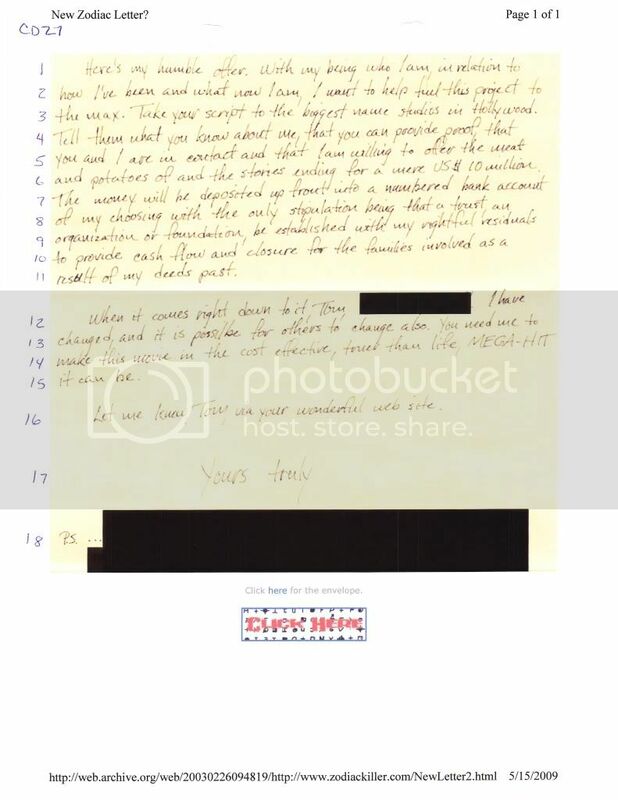 Karr may have been arrested as the emailer to Tracey, but there is an enormous chance that he is only forwarding what someone else wrote just like I contend he did with the letters from JT to TV. Choosing Hushmail, which has it's servers in Canada, appears as another across the jurisdictional line ploy that we saw with all these crimes. Commit them where getting assistance will be impossible. I saw where Hushmail's attorney claimed that he would have the info prepared if Boulder LE came up with a search warrant, but he highly doubted that the warrant would be heeded or affective unless an actual crime had been committed in Canada. What a shame!!!! These emails never cease to amaze me. Finally something to analyze that helps to reinforce my early suspicions of where TV's letters came from. Page 115 "Karr" writes about a subculture which is precisely what the author of TV's letter stated about what they were involved in. I will post links here to TV's letters in case anyone cannot find them themselves, but this cements my theories. This info was subbed to the sender in Thailand/Singapore aka Karr who then explicitly takes entire blame for a crime he knows damn well he did not commit, and how he was found and arrested was in direct relation to these emails that contained pertinent information that he could not know unless he was fed the information, and for that deed, he was let off on an otherwise horrendous crime for his participation. This also means that TV was in possession of pertinent finger print and DNA material, he dismissed as a fake, as conceded by the author of those letters. Ohhhh, and I am not done with the reading just yet.... If JMK is excluded as the author of the TV letters, there is some answers to be had. I need to verify some other info, but it's funny that there is this big push by someone to reveal they are the killers in both the Zodiac and JBR within the exact same time frames, but there is no record of running the DNA or Fingerprints. 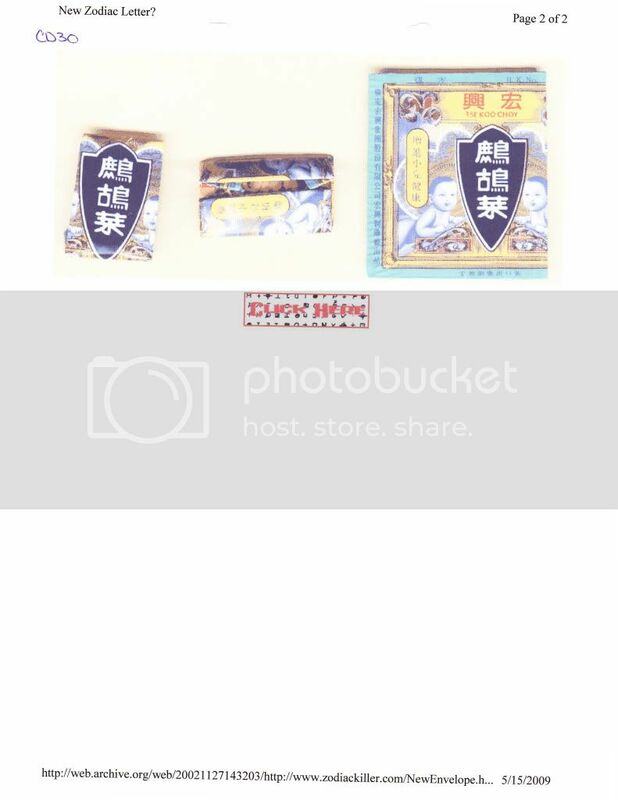 Where is this info? How could the killers of JBR and Z both be wanting notoriety and recognition (while keeping identity under wraps in order to make money to share with the families?) Making it look like they are out of the country with the same backgrounds??? Mother issues, women issues, what other people might think issues, killing issues, writing mo's, and now the language in these communications "separate and totally different sources" are coming at the same time 40 years after the murders saying the same things. Even the Tim Miller letter is hitting at the same time. Coincidence??? I think not! I'm waiting for the "underground" reference to pop up now. It kind of makes sense if JT was the culprit of all that I say is possible, that he was in a hurry to push something through because he was on limited time. Timing is right for the need of recognition by any means possible. I do not think that the suspect would go to the great lengths to send in any sample that would automatically exclude them as a possible suspect because this would instantly demise their position in the movie, the book, and recognition/attention. These are all I have scanned in, but I have others on file in the midst of many files on this case, so I will look to see if this is the besst version to put up here or use ones that aren't re-scanned. I mentioned before that I was going to complete a handwriting exam on JMK with the TV letters. I mention this now because while I find many similarities in the handwriting with JT, I attributed this to JT based on his son Charles who recognized the letters to be his dad's handwritting that he remembered. I will complete the exam to ensure that Karr is not the author even though the words in it are almost identical to his emails to Tracey which then would say that much of what Karr said in them were someone else's words he was attempting to cover for.